Maurizio Sarri cannot escape criticism, even during an international break. Gareth Southgate’s selection of Callum Hudson-Odoi and a two-goal haul from Ross Barkley in England’s game against Montenegro led to a number of sideswipes at the man responsible for giving these players a platform to represent their country in the first place. Any quote from Southgate praising Hudson-Odoi was thrown in the direction of the Chelsea boss, while Barkley’s performance was portrayed as a display produced despite Sarri’s coaching rather than because of it. There are things Sarri could do better, as is the case with all managers, but there is little balance in the coverage of his time at Chelsea as positives are swept under the carpet and perceived negatives magnified. One of the big criticisms of him is the lack of game time given to Hudson-Odoi, a player who should probably be given some more minutes, but those familiar with Sarri’s methods will know that the biggest surprise is probably that he’s getting minutes at all. 892 of them so far, to be exact, so why is the manager the target of so much ire from Chelsea fans and beyond? Maybe it’s because after a blistering start to the season, Chelsea have settled into the league position which most pundits and writers predicted for them at the beginning of the campaign. Maybe it’s because new loan signing Gonzalo Higuaín isn’t the player he was during his time with Sarri at Napoli, or maybe it’s because Sarri appears inflexible, not willing to move from Plan A. There may be a number of genuine concerns at Chelsea, but Sarri is far from the main one. That he is considered the main problem is a concern in itself. Hired to implement a long term plan for exciting attacking football at Chelsea after years of stodgy if not unsuccessful short-term pragmatism, Sarri is the target for some who seem, inexplicably, to want to drive him out of the club he’s just joined. He’s not Jose Mourinho, he’s not Antonio Conte, but that is exactly the reason Chelsea appointed him. He is doing exactly what he has done at previous clubs. If Chelsea expected something different then they mustn’t have even begun to do their homework. It seems he gets criticised for doing exactly what you would imagine, or hope for their sake, the club brought him in to do. Even an England game can’t pass by without jibes being aimed at the Italian, and most revolve around Hudson-Odoi. The 18-year-old had played 80 minutes of senior football at any level prior to this season. There were no loan moves, and no substantial playing time last season under Antonio Conte. Sarri is a manager who is notorious for not starting a player whom he doesn’t trust to carry out his tactical instructions. This usually means young players might not be given chances the fans expected them to get based on their natural ability, because they still aren’t tactically aware or developed enough at such a young age. Despite this Hudson-Odoi is closing in on 1000 minutes under the Italian, and has become a key player in their Europa League side being involved in eight games, starting four of them, and scoring four goals. Exposure to first-team football for the first time in his career has helped Hudson-Odoi reach a level where an England manager is confident enough to include him in a talented young squad, albeit only because of withdrawals of other players due to injury. Because much of this experience at club level has come in European competition, the teenager will have been better prepared for international football. Southgate recognised this, calling him into his squad and eventually giving him his first start in the cauldron of Montenegro’s Gradski Stadium in Podgorica. Away trips to the likes of Dynamo Kiev in Ukraine, Vidi FC in Hungary, and BATE Borisov in Belarus will have prepared him for such an experience, and this is definitely something Southgate will have taken into account when choosing whether or not to start the youngster in a potentially hostile atmosphere. It could be said that Montenegro are effectively one of the Europa League group stage sides in England’s qualifying group. Southgate chose to start him in this fixture and not in the more more difficult game against the Czech Republic, but he eventually brought him off the bench once the game against the Czechs was won, resting Raheem Sterling in the process. The pressure was off, and as a result Hudson-Odoi flourished. It’s a similar approach to the one used by Sarri, who rarely uses Hudson-Odoi in Premier League games but has let him loose in cup matches, especially in Europe. The England manager has discussed this, and even praised the way Sarri has introduced Hudson-Odoi to top level football. “If you look at number of appearances, he has actually been on the field quite a lot, and I know from when we were talking with the club earlier in the season how much faith Maurizio has in him. “He has got some outstanding players just in front of him, but he’s slowly getting more and more game time. “I think he’s maturing well. There doesn’t need to be a rush for him. We’ve seen that with Marcus Rashford and his development. But Southgate gets the praise, and Sarri gets the sly digs. It’s been a similar story with Barkley, whose brace came during an impressive individual display which also included an assist for England’s opening goal. While the focus on Hudson-Odoi was around his lack of minutes at Chelsea, none of the focus on Barkley was on his improvement, at least tactically, and regular game time under Sarri playing in a position he enjoys. The player himself has commented on the influence of his new manager. “I would say Sarri’s philosophy has helped me a lot because over the years I haven’t been coached much. I am at an age now where I understand football a lot more,” Barkley said. “When I broke into the Everton side under Roberto Martínez I was playing in the No 10 role and I had never played there before, so I was getting used to that role as a first-team player. But usually I was a No 8. This reflects comments from former Chelsea midfielder Nathaniel Chalobah who spent time working with Sari during a loan spell at Napoli. “He was very hands on, a great manager, and tactically up there with the best I’ve seen,” he said. “Very into his work. Tactically he knew how to set the team up how to try to stop the opposition, which we worked on every day. 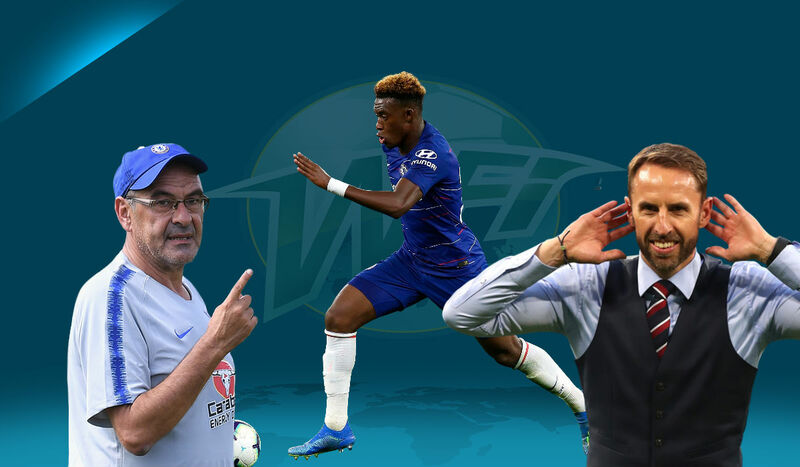 There’s no doubt that Hudson-Odoi will be learning similarly from Sarri, and though he may not be getting the minutes he or the Chelsea fans would like him to get at the moment, this tactical tutelage will stand him in good stead for his future at club and international level. Sarri may never been given credit for this, and the balance of the current coverage may be very much against the Italian, but in the future the young winger may thank his current gaffer for introducing him to top level football and giving him the football education he needs to succeed.